SnoreFreeNow definitely has one of those websites that just sort of lures you in. Before you know it, you have placed an order, and you are not even sure what you just bought. You instantly see international shipping is available, and you can even select to view the site in dozens of languages. It makes it look like this is a very global product, but is it? You also see that it is patented and judging by appearance, you would think it would be very comfortable. Well, I put SnoreFreeNow to the test, and I will have to say, I was much more impressed with the website than I was with the product. I’m not a fan of SnoreFreeNow, but it does have some advantages worth mentioning. Some of my complaints may not be an issue for you, so I’d look at the Pros and Cons to see if anything screams out at you either way. Large airflow hole makes it easy to breathe through your mouth while you sleep. Boil-and-bite method allows you to achieve a custom fit. SnoreFreeNow is made from BPA-free thermoplastic. These snoring mouthpieces are made in America. Reorders for single- or three-pack devices are inexpensive. Product not backed by a guarantee, so you can’t just send it back in 30 days, if you decide it’s not right for you. SnoreFreeNow needs to be replaced every three months, which is a very short lifespan compared to other products. Using a special cleaning solution by SnoreFreeNow is recommended, so you will have to figure that expense into your budget. Claims to be dentist designed, hospital tested, and clinically proven to work, but where is the evidence? If you lose the insertion tool, you have to order a new one to custom fit SnoreFreeNow oral appliances in the future. Can’t be worn by individuals with braces, dentures, crowns, or missing or lose teeth. Disclaimer on site states that use of the device may cause teeth and/or jaw soreness, tooth movement, excessive salivation, obstruction of oral breathing, and temporomandibular joint soreness or pain. SnoreFreeNow is a decent mouthpiece, though I think it is overpriced, particularly when you consider the cleaning expense and short lifespan. It can be custom fit and it does have an airflow hole, but beyond that there is really no standout feature that justifies the price. 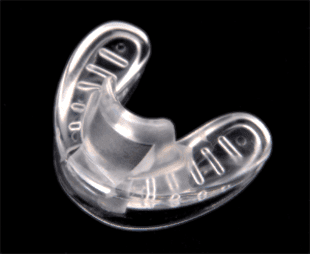 The mouthpiece also does not offer a trial period refund guarantee (almost every other snoring mouthpiece does). 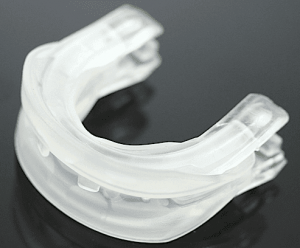 Like other mandibular advancement devices (MADs), SnoreFreeNow is designed to hold your jaw in a forward position. This keeps your airway free of obstruction, so soft tissues are not able to vibrate. 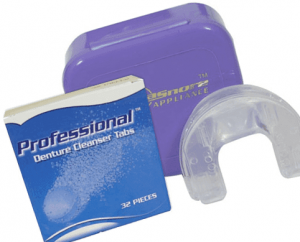 This oral appliance is crafted of a BPA-free material called thermoplastic elvax. At least it is a safe material, so it has something going for it. SnoreFreeNow requires a boil-and-bite technique to achieve a custom fit, but unlike other devices, it has an actual handle you need to use during the process. If you are like me and put things like this somewhere “safe” so you don’t lose them then chances are good you won’t find it until your stumble upon it a year later. I’m not a fan of devices that require the use of fancy tools for this very reason. You can order a tool, but who wants to spend more money on a piece of plastic, when you can almost buy a new mouthpiece for the same amount? If you are a mouth breather, you will definitely appreciate the generous size airflow hole this mouthpiece has. This is one of the (few) things I like about this device. Some have holes that are so small they are pretty much worthless. 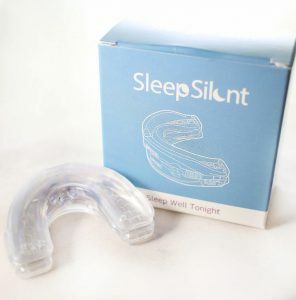 Another device that has a good sized airflow hole is VitalSleep. SnoreFreeNow is made in America and cleared by the United States Food and Drug Administration. The site is also registered with Bizrate, and it is security scanned, so at least you can feel confident that your personal information is secure while ordering. Seriously, if you look at the site, you will understand what I mean about it creating a really respectable image. I just wish I could have been more impressed with the actual product. Also, you look at the very simple design and can’t help but get excited over the fact that it has to be easy-to-clean. There are no major crevices or moving parts, so routine maintenance should be a breeze. Unfortunately, the manufacturer strongly encourages that you use SnoreFree Fresh & Clean, its personal cleanser, so this is an added expense. It does come with a dental case to store the mouthpiece in when it’s not being used. When the SnoreFreeNow devices arrived for me and my wife, we both commented on the peculiar design, as it doesn’t feature separate upper and lower trays. We also thought that for sure it would work well since the ones we previously doubted based on appearance had ended up being some of our favorites. We did the boil-and-bite technique on them right away and cringed at the thought of having to keep track of that handle in case it was needed again. I have a hard enough time finding batteries in a power outage, even though I always put them where I think I’ll remember. That night, neither of us felt any immediate hatred or love for the device. There have been a few my wife has thrown across the room and others we both instantly loved. This one sparked no feelings, which wasn’t necessarily a bad thing. Our senior dog woke me up in the middle of the night for a bathroom break. My mouthpiece had fallen out and so had my wife’s. She was snoring away, and I imagine I probably was, too. I put mine back in when I got back in bed, but by morning it was out again. We were both so tired in the morning. When you use a mouthpiece that actually works and your sleep quality improves, you really notice the difference in how you feel when you go back to snoring all night. I washed both of our SnoreFreeNow mouthpieces and put them away. On the positive side, neither of us had a sore jaw, but only because we slept without a mouthpiece most of the night. That evening, we thought about refitting the MADs again but thought we would give it one more night to see if their falling out was just a fluke thing. It wasn’t. they fell out again, so clearly something was wrong. We had done the boil-and-bite method on countless mouthpieces before, so we were pretty much old pros at it. However, this was the first time both of us had a mouthpiece fall out two nights in a row, so we did the fitting process again (yes, I found the handle). The third night, the same thing happened. We didn’t have one night during the entire trial that the device stayed in. Maybe SnoreFreeNow works for some people with a “special” mouth, but it certainly didn’t work for us. The SnoreFree Kit is $49.99, so it’s not the least expensive option available. However, if this MAD actually works for you then you will appreciate that you can order one replacement mouthpiece for $15.95 or a three-pack for $39.99. Standard shipping is free, or you can upgrade to rush shipping for $7.95. If you want it faster, there is also an overnight shipping option for $30. SnoreFreeNow also has a travel kit for $29.99 that includes a travel bag, dental case, eye shades, ear plugs, and a mouthpiece. A sleep aid kit is also available for the same price, which includes eye shades, ear plugs, and a bottle of Sleep Advantage. The Comfort Fit Handle that you need for fitting these devices is $8.95, in case you lose the one that comes in the kit. The SnoreFreeNow Sleep Advantage Supplement in the sleep aid kit can be purchased separately for $19.95. The SnoreFree Fresh & Clean solution is recommended to use to keep your device clean, and it is $9.95 per bottle. For what SnoreFreeNow offers, you would think it would be priced a lot cheaper. It can be custom fit and it does have an airflow hole, but beyond that there is really no standout feature that justifies the price. Not to mention, you also have to use special cleaning solution that is $10 per bottle. Probably the biggest turn off is that there is no guarantee. At least with other products, you have 30 days to try the product to decide if you like it. If you want an MAD that is moderately priced, comfortable, and effective, I recommend ZQuiet. You don’t even have to pay for the device upfront. You can pay for shipping, and try the product for 30 days before your card gets charged. I also recommend trying Good Morning Snore Solution, which is my personal favorite. It is a tongue stabilizing device, so the design is different than what you are used to with MADs, but it is a very effective product.